Traditional architectural fabric in Kalkan --formed by small building blocks facing narrow streets, courtyards, terraces and balconies-- not only reflects the general characteristics of the Mediterranean architectural style, but also displays some unique architectural features of its own. One of the prominent buildings still standing on and possessing these features is this traditional house restored and converted to a boutique hotel. The building is recognized as one of the few examples in the town, which particularly demonstrates sizes, scales and relations of open-close spaces in Mediterranean architecture, as a typical `part` of an organic `whole`. 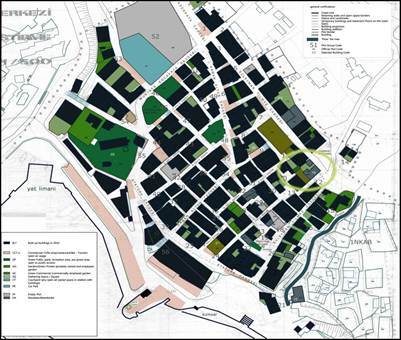 The building is composed of 2 separate rectangular blocks overlooking to a shared courtyard and a small garden space. Larger of these blocks, containing the primary spaces, is formed of 2 smaller blocks, combined together with a big shared roof built around 1970s. The house, which has accommodated one of the leading merchant families of the town, is estimated to have been built around the 1930s. 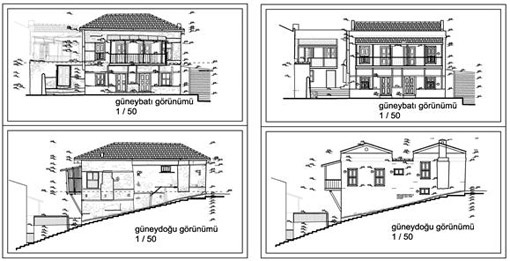 It should be noted that, as many other traditional examples in Kalkan, this building had been built on the foundations of older separate buildings, utilizing in-between spaces and streets, as courtyards and transition spaces. From this viewpoint, the original construction of the 3 foundations probably dates back to the 19th century. The building has been standing from those times, extensively renovated in the 1970s, and was actively used until 1995. The settlement in Kalkan is about 150-200 years old, however the fresh water source and natural harbor on the Bay have been known and employed particularly by sailors, hundreds of years before the settlement. Having served as a primary trade port for the mountain villages and various other locations on the Lycian Peninsula, the town majorly developed in the first quarter of the 19th century. Since there was no highway connection, a considerable amount of export goods of the Lycian Region were transferred through the Kalkan Harbor. Merchants traded sesame, olive oil, silk cocoons, charcoal, grain, grapes, wine, acorns and lumber from the area to the entire Mediterranean region, and also imported many products to the Lycian land. Likewise the other merchant houses of the local settlement, the ground floor functioned as shops or storage spaces, and the upper floor as living spaces, making them more articulated. The house is not the most lavishly decorated example in Kalkan, but the most articulated space of the house, namely the room in the small separate block deserves attention. Elaboration of architectural wooden elements manifests that small block on the north corner was utilized for accommodating influential customers. Meanwhile, the semi-sunken space underneath had been built as a cistern and covered with a stone vaulted roof. Most probably, this small block was built as a single floor cistern serving the other block, and some time later a second floor had been built on, as a guest room. -- The business was probably going very well at that time. -- Water-proof plaster on the walls of cistern still keeps its chemical features and open to examination since the space is serving as bathroom today. The blocks of the building had been built with the traditional stone masonry, whereas interior separation walls with "bagdadi*" technique, so as to make the building lighter. The builder of the house is not known, yet guessed to be a Greek master builder, since most of the stone building works were completed by Greek builders at that time. The slabs had been constructed with simple wooden beams covered with wooden flooring. Getting more delicate on the upper floor, ceilings had been covered with wooden plunks, elaborated on joints and decorated with ornamental reliefs in the middle. The balcony on the southwestern facade of the primary block comes forefront as one of the longest examples of open projections, throughout the rich projection diversity of Kalkan. Doors, windows, balconies, cabinets and decorated racks all constitute typical examples of qualified wood workmanship, where local cedar trees were utilized. Some of these cedar elements in the building are 70-80 years old, still fulfilling their duties and gives off cedar's unique aroma around. 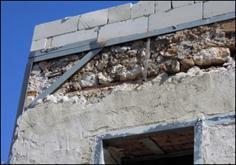 The restoration process had been started with the detailed surveying of the building as well as the definition of deteriorations. The second step was the architectural restoration project and assessment of structural capabilities of various elements of the building. Primary intention of the architects, for both design and construction phases, have been making the building continue its life with minimum modifications on plan layout and building materials, as well as providing requirements of the modern life for a hotel. In parallel, there was no particular changes in the general layout, however small spaces were combined and each of 6 rooms was designed with en-suite bathrooms, making the architects propose a unique solution for each new bathroom space. On the other hand, the perception on south direction was altered particularly, since the form of the roof on larger block is converted to separate smaller roofs in order to refer to the original form of the building. The roof of small northern block was converted to a terrace for guests to benefit the magnificent view of the whole bay. As the first step of the construction, walls of this traditional house was stripped down to its stone core and analyzed structurally. Deteriorated parts of the stone wall were repaired with local stone in similar character. 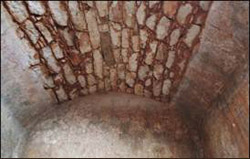 The joints between the stone elements were replaced with a special lime based joint mortar with similar chemical composition as the original material. All the walls were reinforced with extensive steel profiles, particularly on the corners and openings. The plasters were produced on-site, through traditional techniques and local materials which were determined upon laboratory analysis of the original plaster. Most of the wooden elements were reproduced in similar techniques and sizes similar to the original, whereas all the wiring and piping infrastructure is redesigned due to the modern requirements and materials. 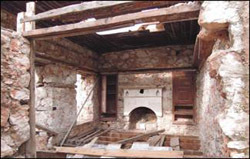 I personally attach importance to this restoration project, as a distinguished conversion from a traditional house to a hotel, and furthermore as one of the few proper restorations realized in Kalkan, which hopefully, may serve as a model for other traditional buildings. *Bagdadi is a wall-making technique in which a main system is built up with load-bearing timber elements, and the wall surface is formed with timber sticks connected to the primary elements. The space between the timbers of 2 faces of the wall is infilled with rubbish and the both surfaces is plastered afterwards. This technique was generally used for civil architecture.